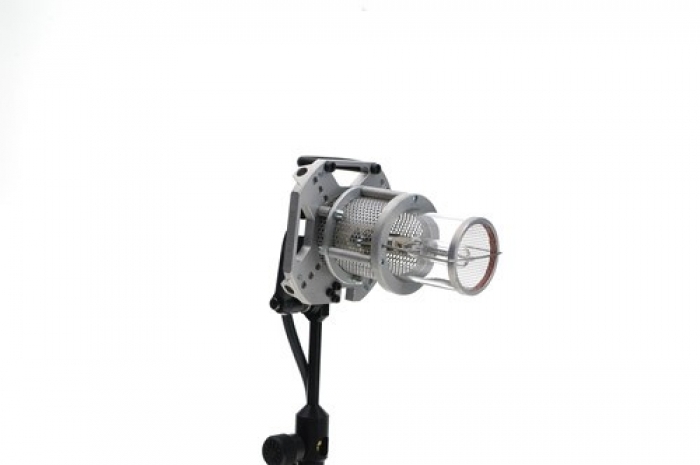 A dedicated single function halogen soft light, exclusively for use with many styles and sizes of soft boxes. The lamp, which is placed in the focal center of the soft box produces a perfectly lit surface. In comparison to a soft box attachment mounted to a Fresnel fixture, it provides double the light efficiency with no hot spots. Readily available halogen lamps from 500–1000 W may be used in this light fixture. The DLH1000S can be a stand alone light or a companion to the classic tungsten Dedolight and Series 400 focusing halogen heads. A protective glass tube is easily removable for quick lamp change. Many styles and sizes of soft boxes may be used with the integrated speed ring. Adapts in seconds and without tools to an amazing variety of soft boxes by the function of the innovative variable size speed ring. The diameter is changed by extending the rod receptacles for the soft box in four steps: 130 mm (5,118“), 150 mm (5,9”), 170 mm (6,69“) or 190 mm (7,48“).